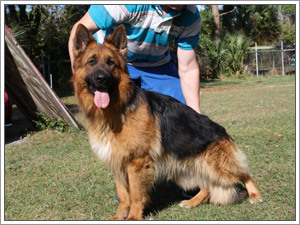 We offer complete German Shepherd training services in Florida. Dog training is the process of modifying how a dog acts and/or behaves. The reason why a pet owner may want to train a dog could be to teach the dog to perform certain actions that assist the owner in some way, or for it to behave effectively in a human's home life. A dog learns from every action it has with its environment. This can be through a number of ways such as association or non-associative learning. However, it's important to never use physical punishment as a form of dog training, as this technique is guaranteed to result in your dog always being fearful or nervous when you come near. Instead, consider rewarding your dog for good behavior. 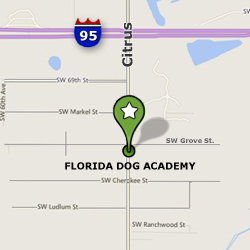 At the Florida Dog Academy, we take a positive approach to make German Shepherd training an enjoyable and fulfilling activity. 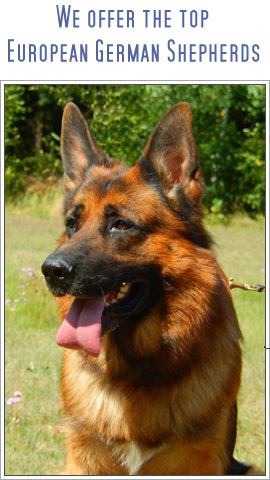 We are qualified and epuipped to train several breeds of dog, however, German Shepherds are the main breed of dog that we train. We believe that German Shepherds show a special attraction toward humans, and by creating bonds with them through positive reinforcement, the training process becomes easier and more effective. We promote relationships of mutual respect and trust. airports, cruise lines, ports, borders, schools, police & military service areas, and atomic power plants. import companies and searching containers for narcotics. dealerships, marinas, hospitals, banks, hotels/motels, construction sites. More,. call us for a complete list. Chief Trainer Alfons Fiesler is in charge of all explosive and working dogs for the German Border Police (BGS). He is also a judge for DHV schutzhund dogs, rescue dogs, and working dogs for police and military. His 40 years of experience and training methods have brought him international respect. Trainer Klaus Rempis is an explosives/narcotics trainer in Florida with over 20 years of experience. "We offer this training locally as well as internationally. We speak English, German, Spanish and Chinese."